Calaméo - Sittercity Reviews - Is Sittercity Safe? Sittercity Reviews - Is Sittercity Safe? 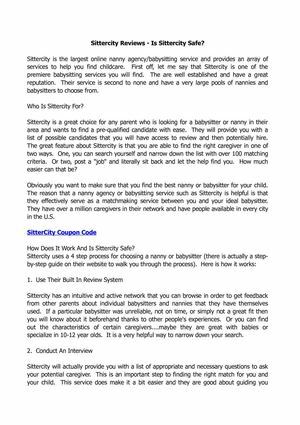 Sittercity is the largest online nanny agency/babysitting service and provides an array of services to help you find childcare. First off, let me say that Sittercity is one of the premiere babysitting services you will find.